Everything from start to finish was first class. The ship was extremely comfortable with every matter attended to promptly by the crew and with a smile. The food was excellent, the service second to none, and activities scheduled and completed with care and consideration. The staff were simply the best. They were always caring and ready to deliver a service that was 5-star all the way.Three staff members stood head and shoulders above the rest; Hue, Lee and ATM (nickname). These young ladies were what service should be all about. Well done everyone. We had a wonderful time on board. An amazing & most memorable 2N/3Days trip on Auco 2. The staff was very friendly, helpful and they went above and beyond to make our trip a super special experience. Espescially the Cruise manager Jay and his associates Ms. Lee, Mr. Lincoln and Ms TM! The warm ceremonial welcome, room with a balcony, amazing staff, the yummy food (even vegetarian Food! 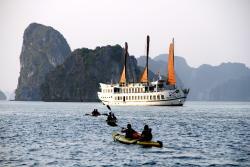 ), great activities, itinerary and the stunning- out of this world- views of Halong Bay! The cruise was fantastic from start to finish. 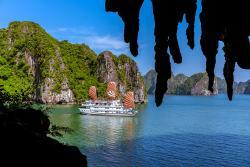 My wife and I have just finished an amazing three day cruise in beautiful Halong Bay. From the minute we arrived at the terminal, Joy Oberiano, our Cruise Manager, and all he team made the experience very special. Our suite was stunning with a huge balcony, the food was delicious and all of the excursions were amazing. Joy and her team thought of every detail and all the staff were a delight - thank you, we will return! 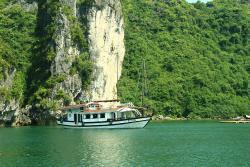 My wife and I recently enjoyed a 2 night stay on one of the Au Co cruise ships on Halong Bay. The tour was led by Sam who was outstanding throughout and ably supported by an amazing crew . We were upgraded to room 218, which gave us a fantastic berth at the front of the boat and added to an overall fabulous experience. On board the food was to a very high standard with excellent service from the staff throughout. Happy hours were available in the well stocked open air bar each night just before dinner and each night enthusiastic traditional Vietnamese entertainment was provided in the dining area by the staff which was much appreciated. The trips arranged by Sam and his knowledgeable team included cave trip, kayaking to a local floating village, trip ashore and bicycle ride to local village on Cat Ba island. Squid fishing is also available each evening with one of the crew in attendance and passing on his fishing skills, amazingly I managed to catch a squid using only a cane rod with a spinner, no other bait required. The overall experience was incredible not to mention of course the incredible scenery. 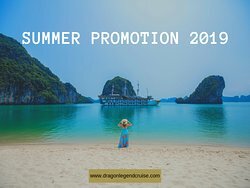 I would highly recommend paying a bit extra for what must be the best eco friendly cruise line operating on Halong Bay. Special thanks again to Sam and the crew including the girl known as ATM who made our experience so memorable. 4 friends traveling. We had two nights on this fantastic boat. Very comfortable. The quality of food, presentation and service was impressive. Loved the kayak cave trip. The staff and crew go out of their way to make the trip a special experience. Sincere thanks to Kevin, Ruby, Luffy and team. I am sure I speak for most visitors when I say - would be nice to see some strategies put in place to start cleaning up the Halong waterways. The rubbish distracts you from the natural beauty of Halong Bay. We spent 2 days and 1 night on Auco 2 boat. The boat is very well maintained, the food is exceptional and the staff is so delightful! We had a tiny balcony in our cabin which was perfect for a peaceful time looking at the gorgeous islands. Thanks for making our family trip so memorable! Highly recommend!